The sun was warm and bright, and the air was filled with the scent of roses and lavender. The river tinkled through Peaseblossom Woods, and the woodland animal relaxed in the soothing warmth of midsummer. I wish there had been early chapter books like this when I was learning to read as a child.The first book in the Superfairies series is an utter delight. 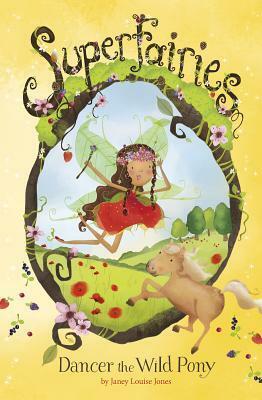 On the very first pages we are introduced to all the Superfairies that live in Peaseblossom Woods. Each fairy has a special power enabling them to work together as a team in order to rescue animals. In this book, they need to help Dancer, the wild pony, who runs off because she is so nervous about appearing in the Summer Fair Dance Contest. I love how the modern world has been incorporated into the fairy world. The fairies track Dancer down using the strawberry computer before following her in the fairycopter. As the reader, you are taken on a tour of the Woods, where you get to meet lots of the other lovely inhabitants. At the end of the book, there is some extra bits to enhance your enjoyment of the story. There is a quiz and a little of the history of fairies. The book is easy reading and not to long, which may even encourage the reluctant reader. The illustrations are simply gorgeous. Jenny Poh has created the type of pictures you just can't stop looking at, as you search out all the little details within them. They really bring the story to life. I really think young children will love this series and will be eagerly awaiting the next instalment. Thanks Catherine. I really wish a series like this had been around when I was little.